Emergency powers introduced in 2015 to counter the threat of terrorist attacks will be extended until Nov. 1, President Emmanuel Macron said after a security meeting on Wednesday. The decision to extend them, announced in a statement from Macron's office, follows the attack at a music venue in Manchester, northern England, on Monday night in which 22 people were killed. 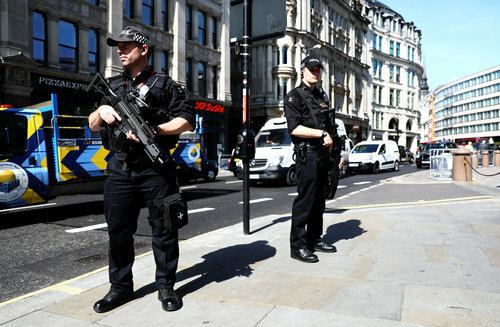 Britain's parliament said on Wednesday it would close to the public with immediate effect due to an increased security threat after Monday's suicide bomb attack in Manchester. 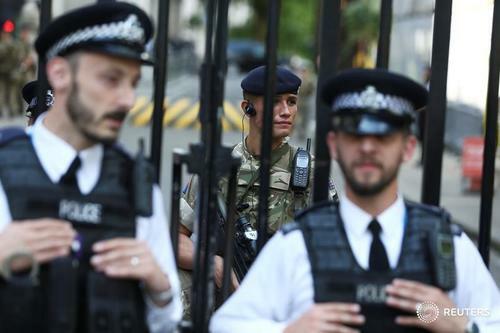 Prime Minister Theresa May said on Tuesday that Britain now faced a 'critical' security threat - meaning another attack could be imminent - and ordered soldiers to reinforce armed police guarding public buildings and events. "As a consequence all tours, events and banqueting will be canceled with immediate effect. This arrangement will remain in place until the advice changes," the parliament said on its website. Parliament is not currently sitting, due to a national election taking place on June 8. Three men have been arrested in Manchester on Wednesday in an investigation into the suicide bomb attack which killed 22 people at a music concert in the northern English city on Monday night, police in the city said. "Three police warrants were executed in south Manchester in connection to the ongoing investigation," a spokeswoman for Greater Manchester Police said. ReutersThe Manchester suicide bomber who killed 22 people at a concert venue packed with children had recently returned from Libya, a British minister said, and her French counterpart said he had links with Islamic State and had probably visited Syria too. Reuters UKThe suicide bomber who killed 22 people including children in Manchester likely did not act alone, Britain's interior minister said on Wednesday as soldiers were being deployed to key sites to help prevent further attacks. ReutersBritain expressed irritation on Wednesday at leaks in the United States of details about a suicide bomber who killed 22 people at a packed pop concert, saying disclosures of that kind could hinder such investigations. A BBC radio station located just outside Manchester city centre briefly stopped live broadcasting on Wednesday after it was evacuated for what turned out to be a fire alarm. Britain is on its highest level of security alert after a suicide bomb attack killed 22 people on Monday evening, just two miles from the headquarters of BBC Radio 5live. "There is no incident. Everybody is okay, and we're back on air," a presenter said after live broadcasting restarted. The radio station had briefly switched to a pre-recorded broadcast. 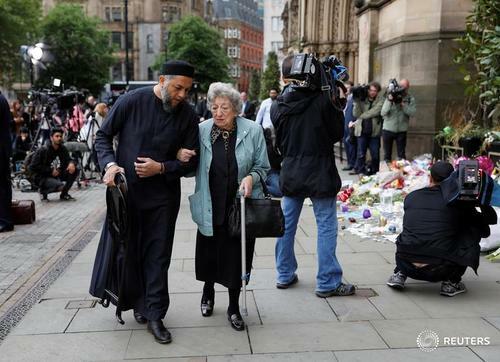 British police are hunting for accomplices who may have helped Salman Abedi build a suicide bomb which killed 22 people at a concert in Manchester on Monday, a source with knowledge of the investigation said. “The question is: Was he acting alone or was he part of a network of others who want to kill. That is what the investigation is focusing on," the source, who spoke on condition of anonymity, told Reuters. “The concern is that there may be others out there who helped him to make the bomb. Making a bomb of this sort requires a certain level of expertise and competence," the source. UK PM May has received condolence calls from Germany's Merkel, King Salman of Saudi Arabia, Swedish PM Lofven and Indian PM Modi. 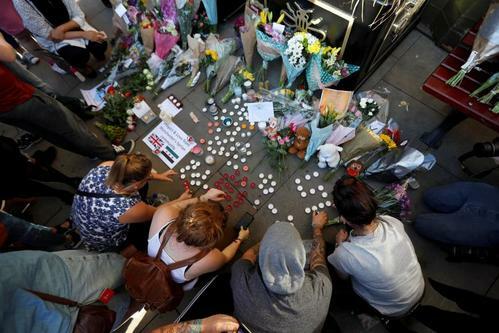 Thousands of Manchester residents gathered in the center of the northern English city on Tuesday in a show of defiance against a suspected suicide bomber who killed 22 people, including children, in an attack at a crowded concert hall. 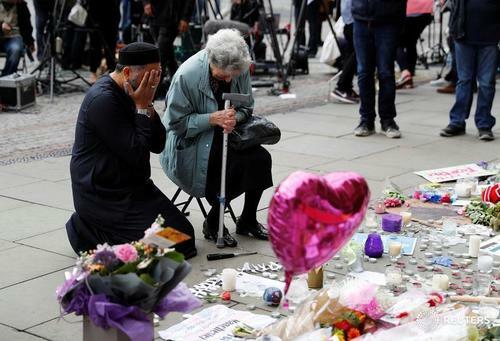 The vigil, held in warm evening sunshine in front of the Town Hall, drew representatives of different religions who, one by one, condemned Monday evening's bombing, which ripped through a crowd leaving a show by U.S. singer Ariana Grande. Members of the city's Muslim, Christian, Jewish and Sikh communities said they wanted to show that Manchester, while shocked, would not be cowed. 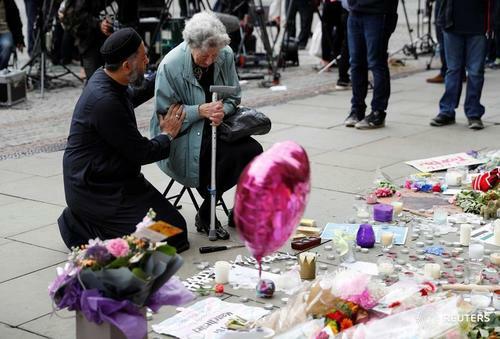 "It was incredibly emotional ... for us especially as Muslim citizens," said Muhammad Khursheed, an imam of a mosque in the Manchester suburb of Hulme. "We will stand together in spite of oppression, terrorism. A strong, powerful message today." British police on Tuesday identified the suicide bomber as 22-year-old Salman Abedi but gave no further details. U.S. security officials, citing British intelligence officials, said Abedi was born in Manchester to Libyan parents. Reuters UKHours after the Manchester suicide bombing, British Prime Minister Theresa May stood on the steps of her official Downing Street residence and promised to give police the resources they needed to investigate the attack. BREAKING: Father of Manchester bomber arrested in Libyan capital Tripoli by counter-terrorism force - spokesman. 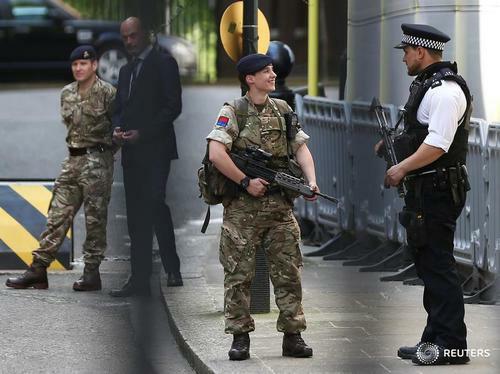 The Manchester suicide bomber who killed 22 people at a concert venue packed with children was part of a network, the city's chief of police said on Wednesday as troops were deployed across Britain to help prevent further attacks. 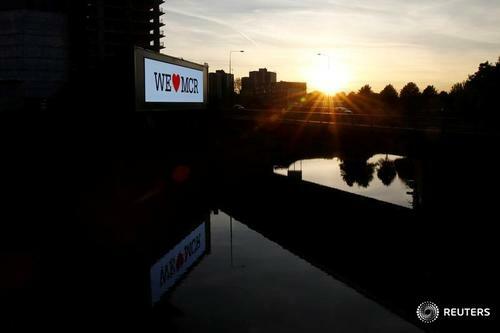 Soccer fans in Manchester gather to watch Manchester United take on Ajax Amsterdam in the Europa League final, two days after the suicide bomb attack which killed 22 people. A moment of silence is expected to take place before the kick off. A fifth person has been arrested in connection with a suicide bombing in the northern English city of Manchester which killed 22 people, police said on Wednesday. The man, who was carrying a package, was arrested in the town of Wigan, 17 miles (27 km) to the west of Manchester city centre. "We have made an arrest in Wigan this afternoon in connection with the investigation into the horrific incident at Manchester Arena," a spokeswoman for Greater Manchester Police said. The following are short profiles of those identified by family or friends as being among the 22 people killed in a suicide bombing after a British concert by U.S. singer Ariana Grande. 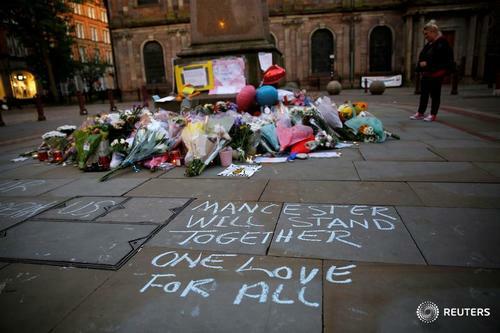 Police made arrests in Manchester and Tripoli on Wednesday as the investigation into a suicide bomber who killed 22 people at a concert venue packed with children focused on tracking down a network of accomplices who authorities fear could strike again. The father of the bomber who killed 22 concert-goers in an attack in Manchester told Reuters in the Libyan capital on Wednesday that he had last spoken to his son some five days ago, by phone, and "everything was normal".